I posted a picture on social media once. I’d been cleaning up the house, and in my travels around the boys’ rooms I discovered just how ridiculously many guns they had. Nerf guns, in particular. Needless to say, my boys have amassed an impressive number of guns over the years. Unfortunately, there’s a problem. The problem with Nerf guns is that they take Nerf bullets. If you’re not familiar, Nerf bullets are spongy cylinders with a suction cup-like tip. Different guns are loaded in different ways – some you’ll actually use something similar to a magazine, and others work like a revolver. So, why are Nerf bullets a problem? First and foremost, the things get lost. You can have a gun which takes 40 bullets (no, seriously, that’s a thing), and your kid will decide he’s Rambo, shooting them into the yard one after another. Who gets to pick up the bullets? Well, it’s probably not your nine year old. After all, what nine year old wants to search for and pick up forty bullets? It’s you. Dad and Mom get stuck with the dirty work. The second problem with Nerf bullets is that, when they get lost, they pose issues. Your pets can find them and start munching on them. The lawn mower can find them and start munching on them. To put it simply, Styrofoam in the yard is never really a great thing. 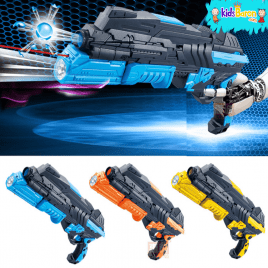 Nerf guns are super entertaining – a great way for your kids to keep themselves entertained. But when you, the parent, are tasked with finding all 40 of those darn bullets, the fun quickly ends. So, what if your kids could shoot each other without damaging your lawn care equipment? What if there were no risk of your poodle finding stray bullets and earning a trip to the vet? Better yet, what if there were a gun that shot biodegradable bullets that wouldn’t harm the planet? Enter the Ultimate Orbeez gun. 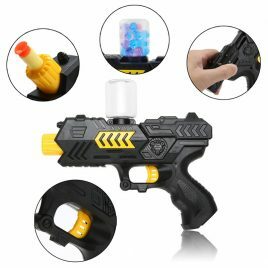 This awesome toy shoots, as the name implies, Orbeez. Never heard of Orbeez? You’re missing out. Orbeez are neat little water beads that expand in size when they’re wet. It’s kind of like the stuff inside a diaper. You know how your baby’s diaper expands when it gets hit with moisture? That’s what these little beads do, too. 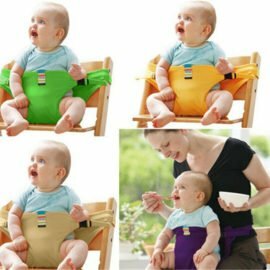 They’re basically colorful diaper filling. Orbeez are soft and squishy, and when you wet them they expand to 150 times their original size. They come in dozens of colors – they kind of look like marbles but they feel like peeled grapes. 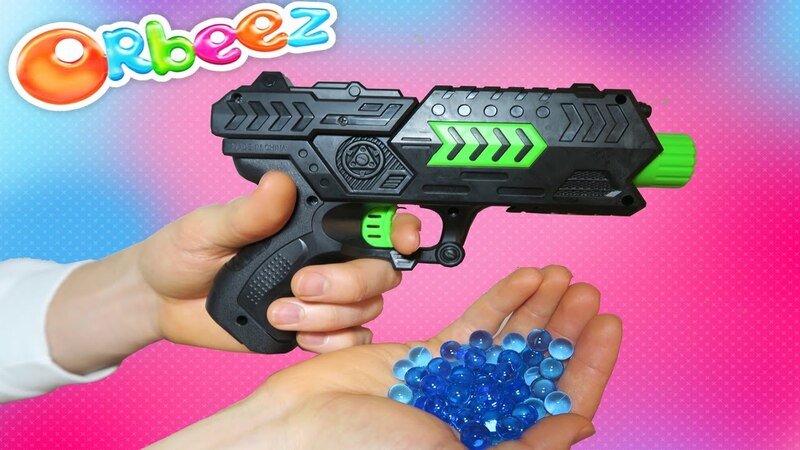 Kids love Orbeez, parents love Orbeez, and Ultimate Orbeez guns shoot Orbeez. Of course, your original Nerf bullets won’t go to waste, either. 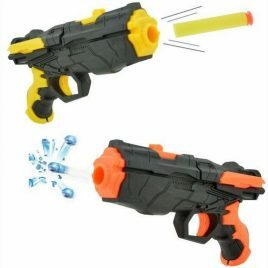 The Ultimate Orbeez gun also shoots the classic style bullet. Orbeez come with a ton of potential. They’re not only good for your kids to pelt each other with, without taking each others’ eyes out. 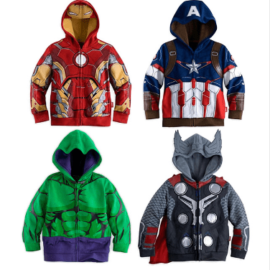 Do a quick search on Pinterest – you’ll see what I mean. Orbeez can be used to fill water balloons. Now, I wouldn’t necessarily recommend your kids pelt each other with these Orbeez-filled balloons, but they do provide entertainment value. Squish the balloon around like a stress ball, then, when you’re ready, pop it and watch it rain. Orbeez can be used for craft projects, both the adult kind and the kid kind. They can be used to fill a kiddie pool, and your kids will love swimming around in them. 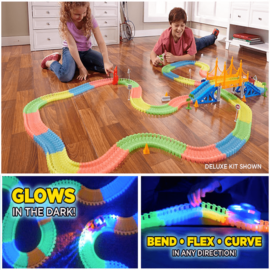 They’re inexpensive, and I promise this: when you get them, you’ll be inspired with about a million different ways to use Orbeez. That brings us back to the Ultimate Orbeez gun. If you’re as tired of picking up Nerf bullets as I am, look no further. The water beads are super inexpensive. You can find them here – we sell a pack of 10,000 of the little colorful balls for less than you’d buy a pack of Nerf bullets. These balls are biodegradable, too. At first, you may be a bit disillusioned at the colorful state of your yard. However, after the first rain, or even before them, you won’t even know they were there. Unlike the Styrofoam of Nerf bullets, Orbeez won’t harm the planet. 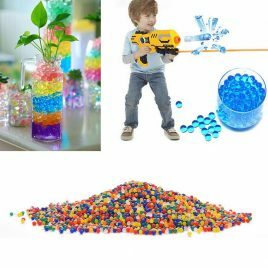 In fact, the polymers in Orbeez are often used in gardening. Because of their ability to retain moisture, gardeners use these polymers to keep plants hydrated. Ultimate Orbeez bullets are non-toxic to pets and to kids. However, keep in mind that they shouldn’t be swallowed. 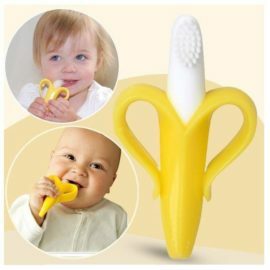 Just by nature of the product, they’ll expand when they make contact with moisture, and this can be hazardous if your littlest kids or your pets swallow them. It’s actually pretty easy, but it’s going to take just a little bit of preparation. First, fill a bowl with water. It’s going to take around 180 ounces (just under a gallon and a half) of water. It’s okay to be a little imprecise. If you want to use a gallon and a half, the extra water won’t hurt your Orbeez. Put your water in a bucket, then drop around 200 beads in. You can adjust accordingly – for example, 90 ounces for 100 beads. Then, just wait. It’ll take around 3 to five hours for your Orbeez to expand to their full size. Once that’s done, simply load your gun, aim, and shoot! That’s all there is to it!